Kids learn these 24 word family words by "filling the houses"! Similar to "bingo" and "lotto," playing the Word Families 1 and 2 Fill-the-House Games gives kids lots of fun practice in decoding words conforming to the patterns. In no time at all, kids naturally learn the basic phonemic pattern. 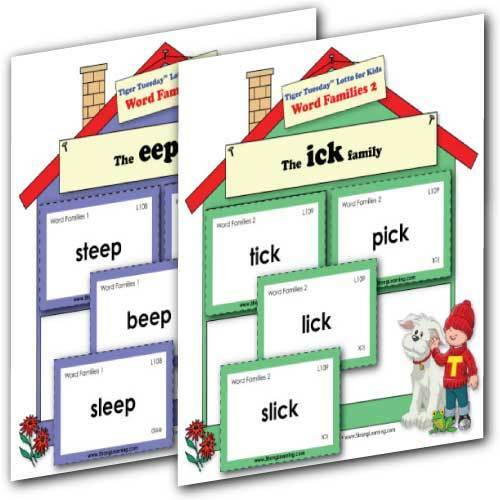 Examples of Word Families 1 "house" boards include: the "ack" family, the "eep" family, the "ide" family, the "ound" family, and the "ing" family. Examples of Word Families 2 "house" boards include: the "ang" family, the "ean" family, the "ick" family, the "ock" family, and the "udge" family. For one-on-one, 2 to 12 players, or combine both games to play up to 24 players.